Premium Bandai updated the page for the CSM Deca-Driver and we now see a new pic of the cards it comes with, which is apparently 30. I think the reason we only saw 4 cards at first was to show the 4 different types of cards it came with, Kamen Ride(Kuuga-Decade), Attack Ride(Illusion, Slash, Blast, Invisible, Auto Vajin, Ongekibou Rekka, Strike Vent, Clock Up, Ore Sanjou), Final Attack Ride(Decade), and Final Form Ride(Kuuga-Kiva, All Rider). Recently I picked up the Super Best release of the Decadriver and suddenly this happens. I'll pay for the cards separately if it gives me a complete collection of Rider Cards, Attack Ride, Final Form Ride, and Final Attack Ride cards cause I spent $100 getting the belt and I'm personally happy with it. My one hope is that the cards are high-quality plastic instead of paper so they will match with the cards that came with my belt and stand some rough use since I'd be using them for cosplay purposes. Alright, 30 cards sounds a lot better. That picture also shows the individual barcodes for each card and the first thing I notice is that Decade's Attack Ride cards (most clearly seen with Illusion and Slash on the middle left) all have an identical barcode. So assuming that's accurate, any hope for the belt announcing individual Attack Ride names has now gone out the window. I figured it would be a long shot - chances are it'll stick with saying the Rider's name instead like with the original DX belt. No Form Ride cards pictured there though so no confirmation on whether those might trigger unique phrases yet, but I don't think the chances are high. EDIT: Maybe still chance for that All Riders card though? (middle right.) Maybe somebody with better knowledge of how the barcode system is set out might know whether we've seen that particular pattern before. Maybe still chance for that All Riders card though? (middle right.) Maybe somebody with better knowledge of how the barcode system is set out might know whether we've seen that particular pattern before. Here is a youtube video of someone using custom cards to unlock every single sound in the original Deca-Driver, and if you skip to 5:10 in the video when he starts the Final Form Ride cards, the first card he uses is a generic card that says "Final Form Ride" when you put the card in, but when you close the Driver it only makes a sound instead of saying a rider name, it has the same barcode as the All Rider card. But who knows, maybe they will replace the generic sound with a new "All R-R-R-Rider!" sound, it would be a pretty easy thing to do. Same thing goes for Amazon's cards, there is a generic Attack Ride, and Final Attack Ride card as well, so maybe they will get custom sounds too. Each of the Showa riders also has a special sound called "Final Ride", maybe they could mod those sounds and make custom Final Attack Ride cards(Even though Amazon was the only one to get one in the show). I just did the same thing, but only because of the price. Look, despite the extra cards, there's going to have to be something MORE to this belt to justify the price, otherwise, I'm content with the Super Best. If the extra cards DO work in the Super Best, then great... I'll pick up the cards only then. Ah that's what I was afraid of. You're right that maybe they could replace the sound but personally I don't see that happening. I think the card set would be a definite for me; I won't miss the chance for show-accurate cards to possibly make better quality versions for myself. The belt itself is looking less likely though at this point. Unless it's all some kind of cruel joke, they specifically confirm newly recorded sounds!!! "Attack Ride: Ongekibou Rekka" is the example they use. Personally I think the sound we hear is a little disappointing if that's the accurate recording - and it definitely isn't spoken the same way as you hear it in the show. Still, this has got to be good news, right? Okay... if that's true, then I'm getting it... no doubt. Guess I'll mosey on over and pre-order it. Not to mention it has a new button on the underside that plays Decade's background music, so now you can really recreate the henshin sequence and battles. And all new sounds never seen before, like "Kamen Ride: Skull". I just snagged one with the cards... can't help it... Decade is one of my favorites. Would it be too much to ask for W-Drive and their forms? And a Goseiger card for when he used it in Super Hero Taisen. Why must Bandai actively seek all my monies? New sounds, too? You know, I was hoping I could just get away with maybe ordering the cards...now I'm really tempted to get the full Belt and Cards. 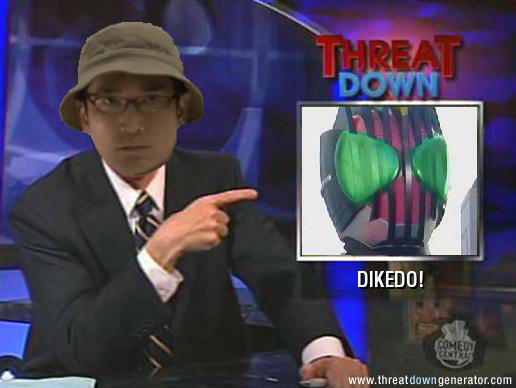 This is also Decade's fault. I need more details to make up my mind. I love my Super Best version, but if this thing comes packed with more sounds, I might just go for it. On the other hand, if it doesn't have enough new sounds but the already released cards are compatible with the Super Best, I'll totally buy just the card pack. Buuut I won't hold my breath for either option. WELP, they actually did it. Wow, I can't believe no one brought this up yet, but on top of all the new sounds there's a button on the bottom that'll play two tracks of background music! I don't know if it'll play them even when you're using the belt, but it's awesome regardless! I can't believe no one brought this up yet, but on top of all the new sounds there's a button on the bottom that'll play two tracks of background music! I don't know if it'll play them even when you're using the belt, but it's awesome regardless! Now this truly excites me. I really, really liked the OST that year. - It looks like two binders will also be included with the Card Set (for storing all the cards) and some sort of info booklet as well. - I'm not sure if this applies to pre-ordering either the Driver or the Card Set, or if you have to pre-order both together, but when you do you'll also get three bonus cards: "Kamen Ride: Diend", "Kaijinride: Eagle Undead" and "Kaijinride: Moose Fangire". I do have one thought though: those bonus cards were all used in the Diend Driver. If they're bonus items here, does this mean there's not much chance of a CSM Diend Driver somewhere down the line? Well this all settles it: both items are a definite purchase for me now! I'm going to contact a middleman straight away! Last edited by bushwacka666; October 26th, 2014 at 03:14 AM. Reason: Realised there's no "FAR: W" card; what we see is what we get!